We just reached a milestone—our 100,000th grant application. Interestingly, it’s for a K99/R00 (Pathway to Independence) award. This program enables promising postdoctoral scientists to receive mentored—and later independent—research support. Given our strong commitment to research training, mentoring and workforce development, it’s somehow fitting that this application is for a program that addresses these needs. I remember well when I submitted my first independent grant application, R29GM038230. It was for a FIRST award, an earlier program directed toward helping early stage investigators develop their independent careers. I submitted the application before there was a Grants.gov—and even before there were overnight delivery services. Since I was located in Baltimore, not far from NIH, I personally drove the application down to the old Westwood Building, where the predecessor to the NIH Center for Scientific Review (and NIGMS) was housed at the time. After I presented my carefully wrapped box, I watched as it was thrown on top of a pile of other applications that reminded me of the warehouse scene at the end of “Raiders of the Lost Ark” . Needless to say, I was relieved when I got the self-addressed card indicating that my application had been received and assigned a grant number. While this is just one small example of how much things can change over time, it leads me to think about other changes and other milestones. One major milestone is coming in 2012, when NIGMS will mark its 50th anniversary. It will be a time for reflecting on the great scientific progress that has been made with NIGMS grant support and also on the opportunities and challenges that lie ahead. You can expect to hear more about the events associated with this anniversary as our plans develop. An important step in the annual budget process is the release of the President’s budget request, which happened yesterday. 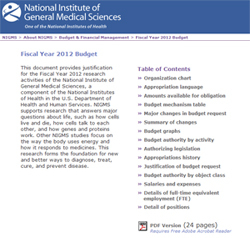 The NIGMS slice is detailed in our FY 2012 budget justification, which includes a budget mechanism table, budget graphs, a Director’s overview and a justification narrative. The proposed budget for NIH calls for an increase of 2.4% over Fiscal Year 2010 actual expenditures. The proposed budget for NIGMS represents a 2.5% increase over Fiscal Year 2010. The reason that the comparisons are to Fiscal Year 2010 is that NIH is currently funded at that year’s level under a continuing resolution through March 4, 2011. As described in NIH Guide Notice NOT-OD-11-037, until a final Fiscal Year 2011 appropriation is enacted, NIH is issuing noncompeting research grant awards at a level below that indicated on the most recent Notice of Award (generally up to 90% of the previously committed level). This is consistent with our practice during the continuing resolutions of Fiscal Years 2006 to 2010. NIH will consider upward adjustments to these levels after a final appropriation is enacted. The NIH Scientific Management Review Board will hold a teleconference on Wednesday, February 23, from 11:30 a.m. to 1:30 p.m. Eastern time. The discussion will focus on the NIH proposal to create a new National Center for Advancing Translational Sciences (NCATS) and its impact on other programs at NIH, including the National Center for Research Resources. The teleconference is open to the public and time will be available for public comment, but those wishing to make comments need to sign up in advance. Details are in a Federal Register notice . The launch of the International Year of Chemistry 2011 is a good opportunity to reflect on the NIGMS role in supporting research in this central field of science. NIGMS is the leading institute at NIH in funding chemical research, supporting a range of studies focusing on such areas as the development of synthetic methodologies for new drug discovery and synthesis; the role of metals in biological systems; and the discovery of new analytical techniques for the detection, identification and quantification of human metabolites. In fact, just about every branch of chemistry has a connection to the study of human health. We’re proud that our support has led to many breakthroughs and significant honors, including 36 Nobel Prizes in chemistry. We also play a major role in training in chemistry through both research grant support and training awards. In 1992, we initiated the Chemistry-Biology Interface institutional predoctoral training grant program, which today supports chemistry students who wish to be cross-trained in biology and biologists who wish to be cross-trained in chemistry in 23 institutions across the country. And you can frequently find NIGMS-supported postdocs in the labs of leading chemists. We foster effective mentoring in chemistry in a variety of ways. One example is the mentoring workshops we’ve sponsored since 2005 for new faculty in organic and bio-organic chemistry, who meet once or twice each year. Representatives from the federal agencies that support chemical research, including NIH, the National Science Foundation (NSF), the Department of Energy (DOE), the Army Research Office, the Air Force Office of Scientific Research, the Office of Naval Research, the Environmental Protection Agency, the Department of Agriculture and the National Institute of Standards and Technology, meet annually to compare notes on our different programs and discuss cross-cutting issues. These exchanges can lead to collaborations, such as the workshops for chemistry department chairs that NIGMS, DOE and NSF have co-sponsored for several years now to help increase diversity in the ranks of chemistry faculty. You can read reports at http://chemchairs.uoregon.edu/display/GenderEquity.pdf and http://chemchairs.uoregon.edu/urm/images/urmreport.pdf (Links no longer available). And we will participate with NSF and DOE in a “FedFunders Town Hall Meeting” at the American Chemical Society (ACS) national meeting in Anaheim on Monday, March 28, from 4:30 to 6:30 p.m. This event is a good forum for meeting and talking with staff from the three agencies. The staff at NIGMS who handle chemistry research portfolios are always ready to talk with grantees, applicants and potential applicants about chemistry and support for chemistry projects, and we can frequently be spotted at chemistry-related scientific meetings. Miles Fabian and I will be at the Anaheim ACS meeting and John Schwab plans to attend the ACS fall meeting in Denver. We hope to see some of you there. A story titled “America’s Brain Drain ” that aired this past weekend on the CBS Sunday Morning show featured an interview with long-time NIGMS grantee Frank Bayliss of San Francisco State University (SFSU). It described how he is trying to nurture smart American students who are interested in pursuing science careers, in part through programs funded by the NIGMS Division of Minority Opportunity in Research (MORE). In recognition of his contributions in this arena, Frank received the Presidential Award for Excellence in Science, Mathematics and Engineering Mentoring in 2009. The segment also featured a MORE-supported student, Damon Robles, who participated in our Bridges to the Baccalaureate program at the City College of San Francisco. He later transferred to SFSU, where he became a Minority Access to Research Careers undergraduate student. Now, he is in a Ph.D. program in physical chemistry at the University of California, Davis. Our MORE programs represent some of the ways we seek to foster a diverse scientific workforce and prepare students for careers in science-related fields. If you’re interested in finding out how you can support a MORE student in your lab for a summer or longer, contact me at singhs@nigms.nih.gov or 301-594-3900.